The play Hemal and Nagrai is based on a Kashmiri folk tale. It is set in the valley of Kashmir with the background of Mountains, Springs and lush green forests. The play takes us back to a time when the three worlds would collude and legends would be born. The play was performed in Shrewsbury, MA by kids of the Kashmir Youth Group of Massachusetts. This group has made a tradition of creating and performing Kashmir based plays at community events. We encourage you to use this script to perform plays at your own events. Some of the group’s earlier plays are regularly downloaded for performances. - Narrator: Long ago, in the land of Kashmir, lived a Hindu fakir. He lived with a vile woman, who was in fact his wife. A Brahmin of no money, no children, no life. His name was Soda Ram, she was Anjali and only death could set them apart. Was death to approach the wife, with a snake to the heart? - Soda Ram: Oh dear Anjali, I am so sorry for forgetting to get milk on the way home, but I saw my dear friend Raj after so long, and we talked for much time. - Anjali: I give you one request, and you cannot even do that. Your stupid friend could have distracted you! You are hopeless. I would have been better off marrying your friend. I bet you’re even too lazy to go to the kingdom to get some alms. Soda Ram: (Mumbles) Anything to get away from you. Anjali: Excuse me, what did you say? Soda Ram: Nothing my dear, I’ll go right now. Narrator: And so Soda Ram, embarked on his journey to receive alms from the king. On his way he decided to sing. She is se – e – l fish. Oh! Please help me greatly lord Hanuman ji. But suddenly his song came to an abrupt brake, as he stumbled upon a hideous snake. The snake he began to scan, as he hatched his terrible plan. Soda Ram: I could take this snake back to my wife, and she would be bit in the heart, then I will finally be free from her constant nagging. Narrator: So, Soda Ram returned home, snake in hand. About to carry out, his repulsive plan. And once he reached, he gift-wrapped the snake from head to toe, and waited for his wife to return so…. Soda Ram: Hello dear wife, I have brought you a present from the kingdom. Please do accept it my love. Anjali: A present, for me! Oh boy, maybe you have come to your senses and are going to give me the respect that I deserve. Oh Lord! Soda Ram: (Giggles) Finally I have been freed from the menace that is Anjali. Narrator: She turned for the better and they raised him fairly, both were quite caring. The king of snakes Nagrai had been captured. He had only chosen to be a boy, he didn’t play with normal toys. While others were playing hide and seek in the streets, Nagrai was catching mice with his feet. He could turn from snake to boy in a snap of fingers, yet one thought on his mind would always linger. Nagrai: I am curious about the world, and how all the things in nature, influence each other in such harmonious ways…(Pause) Also because I’m starting to smell pretty bad and need a bath! Soda Ram: Well, son, the only spring in the entire kingdom is located in the palace, and belongs to the princess, Himal. Nagrai: But father, you are forgetting that I can turn into a snake. I could easily slip through the cracks in the palace walls. Soda Ram: Son if you are to take my advice, do not go. But you are old enough to make your own decisions. Narrator: Assuming his snake form, he twisted and faked. And eventually, he reached the lake. Once there he became a human once again, but little did he know, he had a friend. When I’m slipping through the pa- lace walls. To make it a perfect day. Whew, it’s been a while to get here. Let me enjoy the spring now. - Princess Himal: Wait, what are you doing here? This is my spring. Nagrai: Oh, sorry, I thought that I could try to take a bath. Himal: It’s okay, I just want to know how you got in? Nagrai: Umm, I climbed the wall. Himal: No come on, tell me. Nagrai: I would rather not say. Nagrai: I am Nagrai (Bows). Narrator: And so sprouted a friendship. Unseen for years, but the king would not hear. That his daughter was ken, with such poor of Men. He disapproved as most would, but he couldn’t stop her, no one could. And so they became acquainted, a friendship like this could not be taunted, but Nagrai made sure, his secret remained. In time they got married for which Nagrai brought riches using some serpent magic. If this were to end, it would surely be tragic. And he gives me joy with every moment I am with him. Down in the underworld, where the snake lord used to live, his old wives’ patience began to give. And eventually, they could no longer bear it. They were so greedy that they did not even care if, they destroyed a lasting friendship. Oh how Garish. They wanted the king to return to his crown, this is how it went down. - Wife 1: Where is the Nagrai. - Wife 2: Can’t you see, he is too busy fraternizing with the humans, to actually rule his domain down here. He will never come back if we don’t do anything. - Wife 3: So what do we do? Go up there ourselves? Wife 2: Actually, that’s a great idea. Wife 3: Remembers his attachment to this place. Wife 2: Good Idea, let’s go quickly. What did he leave us for? Where can we find him now? We just want him back! Narrator: And so they embarked on their great journey, to get their husband back before the big husband-wife tennis tourney. Wife 1: Hello, you must be the lovely princess, Himal. Would you like to buy some vases? Hemal: These are absolutely delightful, I will pay reward for this. Hemal: That is no way to treat me. Those vases are worth at least thousands of dollars. Wife 3: No we insist, please take them. Just take them for free. Hemal: No here, take this neclace. Hemal: (Inspects the vase) What! Is she insane? Such fine vases for just one gold coin! I cannot wait to show Nagrai. Narrator: So Hemal went back and showed her new friend, but little did she know, their troubles just did begin. Hemal: Oh Nagrai, look at these pretty vases I got, all for one gold coin. Nagrai: (Looks in surprise and disgust) Destroy those wretched things right now! Hemal: But why? I like them. Hemal: Wow, I’ve never seen Nagrai like this, I better destroy these vases fast. Narrator: Yet, the princess was still quite wary, because since then, Nagrai’s mood did vary. She didn’t know what to think, she was about to be pushed to the brink. So when the wives came with a second attempt, her decision was unkempt. Wife 1: Oh hello princess, we meet again. Wife 2: What happened to those vases we gave you? Hemal: Oh Nagrai destroyed them. Wife 3: That was a mean thing to do, why would he do that? Hemal: I don’t know, it was like he was a different person. Wife 2: Oh, by the way, do you know, where he is from? We hear that he is already married. Hemal: Wow, actually, now that you mention it, I don’t know much about him. I should ask him. Wife 1: Oh, but he is a huge liar, so make sure you put him in this bath we are gifting you, full of milk. Then only will he tell you the real truth. Hemal: Um, all right, I thank you all for your help. Narrator: And so, as Himal forced Nagrai to bathe in milk despite his pleas and protestations. The serpent queens pulled him from under the magic bath into the underworld, where to he vanished. A great friendship was now sadly finished. Himal was forlorn and grief had her torn. She had erred and so she knew. Turning now to charity she gave away seeking parity. Then one day she heard a story that would cause change. - Old Man: Thank you Himal for being so giving. For being so kind I will tell you a story. - Old Man’s Daughter: Yes madam. It was a full moon night which held this amazing sight. Old Man: At night as we lay under a tree, near a spring did we hear a great noise is if an army was on march. Old Man’s Daughter: Many serpents appeared who turned into servants. They appeared from the spring and made a grand feast. Old Man: Then appeared glowing serpents who turned to a Prince and Many Princesses. They ate well. Then they all left but for the prince. Old Man’s Daughter: The prince may have seen us and left some food with a note saying “ This is in the name of unlucky Himal”. Old Man: And then he disappeared in the spring. The serpent prince he must have been, who can change his form at will. Narrator: Himal could put it all together. It must have been Nagrai, the serpent prince he must be. She persuaded the old man and his daughter to take them to the spring, and rewarded them with gold and some more bling. Then with her own eyes she saw the sight, which had brought the old man fright. The army of servants left and the brooding prince stayed. It was Nagrai who the princess saw. Himal: (Catches hold of Himal’s leg). Do not go now my lord. I know I made a mistake. Nagrai: I will come back for you. If they see you, they will kill you. Himal; No, I can no longer stay without you. Nagrai: Alright, you come with me now. Narrator: So they left for the Serpent Kingdom. Serpent King Father: I smell human flesh. What have you been upto Nagrai? Nagrai: Father, Himal is here. Could she stay? She has suffered so much. Serpent King Father: Only as a cook can she. Narrator: So the princess became a cook for her friend and husband but fate as kind was not to be. By mistake, the serpent children drank milk hot as can be. Perish they did not but cry they sure did. Bites of the serpent queens were much to take and the queen Himal was not to be. Nagrai could not let go and his grief was for all to see. He left the body at the feet of the lord and prayed for divine intervention. - Holy Man: This is the most beautiful person ever, I have seen. And this is the love of a wife and husband the most pure that can be. So come to life Himal and follow me. I will return you to your husband when better you will be. Narrator: Nagrai came back to the lord’s feet, looking for Himal but where was she? As a snake he wandered till he found her. Wrapped in a coil by her side he waited for her to wake. Holy Man’s Sons: Look a snake is here to harm our father and this girl. Narrator: And lo, they killed Nagrai and thus ended both lives. The faith of these kind souls had been tested enough by the Gods and with full credits they had shone. So the Gods made a boon. That they should again join, and live life fine. Holy Man: Alas, what have you done. You have killed the most beautiful souls in this Universe. Oh Gods, what can I do? Oh two birds I see. Are you the messengers of the lord? Where from have you come? - Birds: Take this water and sprinkle on them. Say your prayers and if your sons also join in repentance, Himal and Nagrai may come together again. Holy Man: I bow to thee my Lord and Mother. None other than Shiva and Parvati are you. I will do as is your command. Sons, let us pray. Narrator: And as they sprinkled the water on Himal and Nagrai, they came to life in full human form and lived happily forever without any other mishap. In remembrance of Himal and Nagrai, all forests where Himal wandered looking for Nagrai are called Heewan and all springs are called Nag, in Kashmir. 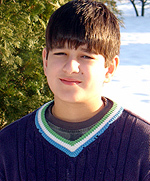 *Arman Koul is a 13 years old, 8th grade student from Andover, MA. He enjoys reading, music and sports, not necessarily in that order.